The Open has an astonishing legacy of inspiring champions. Since the Championship began, golfing greats have set out to become the Champion Golfer of the Year and lift the iconic Claret Jug trophy. Millions across the globe have been united by shared memories of unforgettable moments that unfold at The Open. ‘The Greatest Finishes Challenge’ is a pop up golf putting experience at Glenmorangie House, located in The Open Spectator Village at Royal Troon Golf Club. 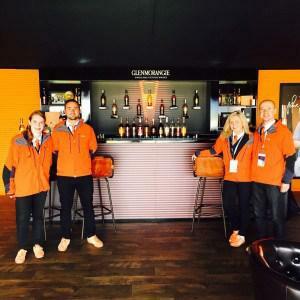 Glenmorangie House is the public whisky bar onsite, selling whisky, cocktails and soft drinks. Glenmorangie have replicated the 18th green at Royal Troon in a scaled version and are giving consumers the chance to putt on the grass surface. Our amazing team are running the pop up golf putting experience throughout the tournament, encouraging participation, recording data and score.